Nisim is now offering the NEW HairMax LaserComb with a replaceable AA alkaline battery. With this Advanced 7 Laser hair comb, experience real hair growth with minimal effort. Rest easy knowing you have invested in a first-rate product, manufactured with the highest quality components and designed to last a lifetime. The Laser Comb is a perfect compliment to the Nisim line of hair care products. 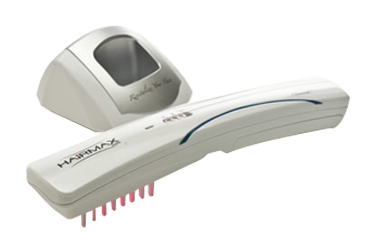 HairMax LaserComb is an exciting breakthrough of hair loss treatment in men and women. 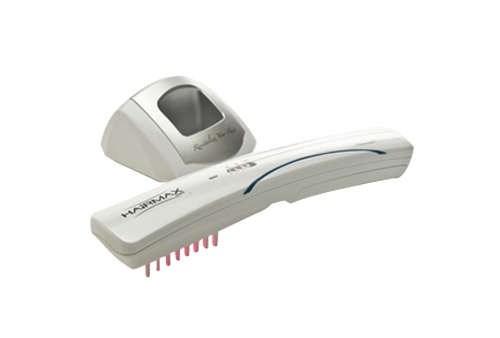 HairMax LaserComb is a home-use low-level laser PhotoTherapy device to treat hair loss (Androgenetic Alopecia) and promote hair growth. The Laser PhotoTherapy process bathes the hair and scalp in laser light to energize weakened hair follicles. In addition to new hair growth and reduction in shedding, many users also routinely report normalization of scalp conditions, increased body, shine and manageability of their hair. Individual results may vary, but over time, most users continue to see an improvement of their hair and scalp conditions If you stop using the HairMax your hair may regress back to its original state. Thousands of men and women worldwide have discovered the power of laser therapy treatments for the improvement to the appearance of their hair. Men and Women of all ages have already achieved exciting and impressive results. Over 90% of LaserComb users see visible results within 12 weeks and are satisfied with the improvements to the appearance of the their hair. Improve hair condition. Increase hair shine, bounce and manageability. Convenient home treatment. No more traveling to hair care clinics. The LaserComb is designed to be used in the privacy of your own home. Can be used for men and women of all ages. User satisfaction is high! Over 90% of all users are satisfied with the results achieved. Easy to use. Only 15 minutes, three times a week for optimum results. Certified and completely safe. Complies with USA laser product safety standards, without risk of negative side effects. TIME Magazine's "Inventions of the Year"
*The results of 4 clinical studies were published in January 2014 in the peer review medical journal, â€œThe American Journal of Clinical Dermatologyâ€. Read the complete study. Use the HairMax 3 times per week on non-consecutive days. (For example, Monday, Wednesday, and Friday). The total time of each treatment should be 15 minutes. More frequent or longer usage will not increase results. Maximum results will not be seen if you do not follow the recommended treatment schedule. Slowly glide the HairMax LaserComb over your hair scalp for 15 minutes, three times a week on non-consecutive days.